Overkill Software's Payday 2 will cover the complete heist experience, including everything from careful planning to watching it all fall apart. While the original Payday was a fun tribute to popular heist movies, it wasn't able to cover everything. 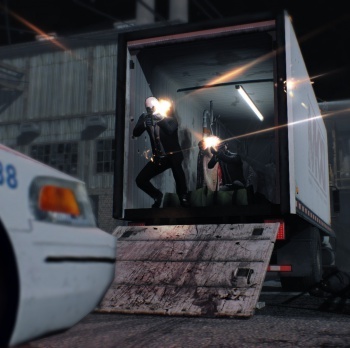 Most missions consisted of little more than hour-long shootouts with police, which technically is just one part of the heist experience. What about carefully scoping out the location, crafting an infallible plan, and then watching it all fall apart when your partner gets a twitchy trigger finger? These are the kinds of features Overkill Software will include in Payday 2 with its randomized phase system. While run-and-gun shootouts are still valid, players can use a planning phase to buy mission-specific resources, or attempt a stealthy entry before the alarm is raised. But even if you think you've prepared for every eventuality, Payday 2 adds randomly selected scenarios that complicate your clean escape, like FBI ambushes or surprise betrayals from trusted allies. "The problem with Payday 1 is we had these monolithic hour-long missions that nobody wanted to play," game director David Goldfarb explained. "Now we have the flexibility to cover the spectrum of all missions," making it easier to "play for 10 minutes and feel awesome". Each job in Payday 2 will be broken down into randomized phases that make each playthrough a little different. The planning phase lets players use earnings from previous heists to buy strategic modifications to the level. For example, you could purchase access to local camera feeds, unlock an alternative entrance, or even hire a sniper to provide covering fire. Once you've finished planning, the mission shifts to its action-oriented phases where you must reach an objective, take the loot, and get out. Players can attempt to sneak past guards and cameras, or pull a Mr. Blonde and shoot everything they see. Of course, the randomly chosen scenarios could make this decision for you, but all told it should allow for a more organic experience. We'll have to wait and see if Payday 2 plays as advertised, but at the moment it sounds very promising. The best sequels are those that expand gameplay to the next logical step, and on that front Overkill seems to be moving in the right direction. Payday 2 will launch for PC, PS3, and Xbox 360 platforms on August 13, 2013.